GAY(M) jam is a competition to help students develop games that promote LGBTQ+, inclusivity and diversity in the gaming industry by focusing on the positive depiction of sexuality and the creation of authentic and impactful LGBTQ+ characters or story lines. 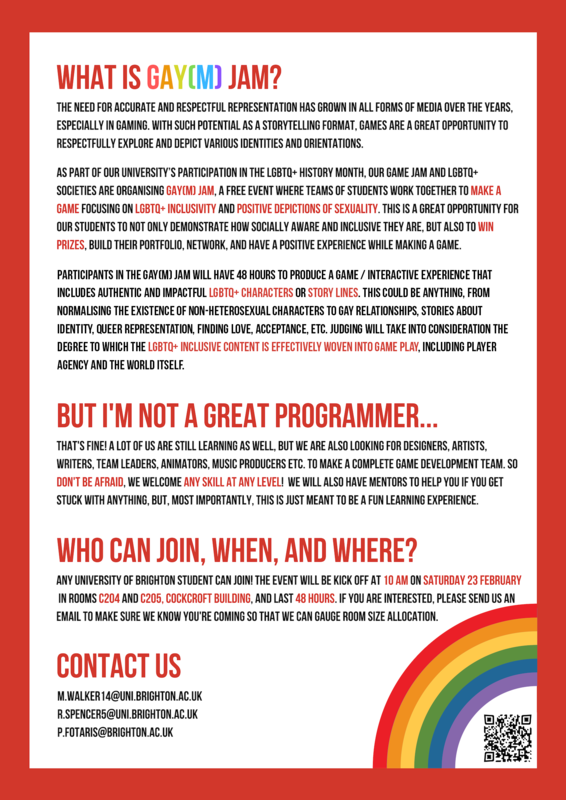 This event is open to all University of Brighton students and organised by the LGBTQ+ and Game Jam Societies. The funds raised will be used to provide prizes to the winning team, as well as to help the LGBTQ+ Society organize LGBTQ+ events and activities (e.g., History walks, film screenings, marching in Pride etc.) It will also be influential to help students break into the video game industry. We are Marc and Rowan, the President and Secretary of The Game Jam Society. 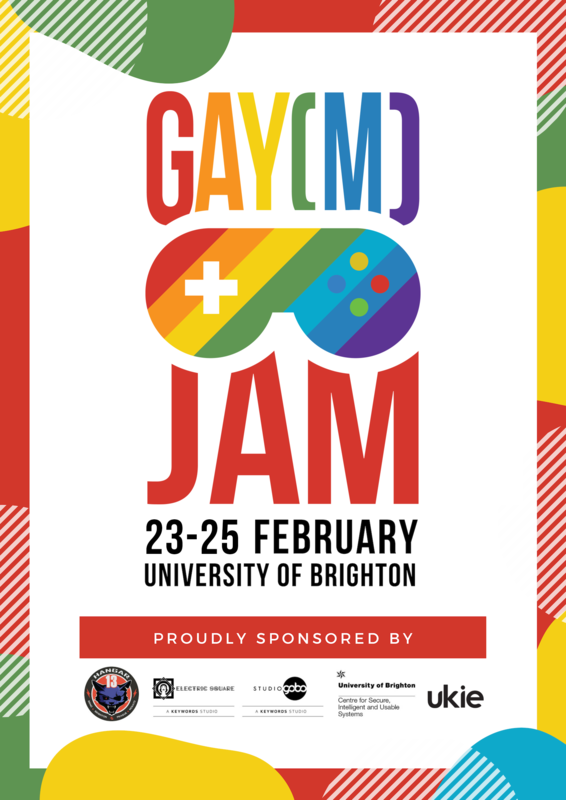 As part of the University of Brighton’s participation in the LGBTQ+ History Month, the Game Jam Society wants to support our fellow students who identify with the LGBTQ+ community by organizing for the first time in our university GAY(M) Jam, a Game Jam themed after inclusion and diversity within gaming. GAY(M) Jam is a free event where teams of students work together for 48 hours to make a game from scratch that focuses on LGBTQ+ inclusivity and includes authentic and impactful LGBTQ+ characters or story lines. This could be anything, from normalizing the existence of non-heterosexual characters to gay relationships, acceptance, stories about identity, queer representation, finding love etc. Judging will take into consideration the degree to which the LGBTQ+ inclusive content is effectively woven into gameplay. This is a great opportunity for participants to not only demonstrate how socially aware and inclusive they are, but also to get first-hand experience on how to make a game from scratch, build their portfolio, improve their teamworking and communication skills, be creative, network, win prizes, and, most importantly, have fun! 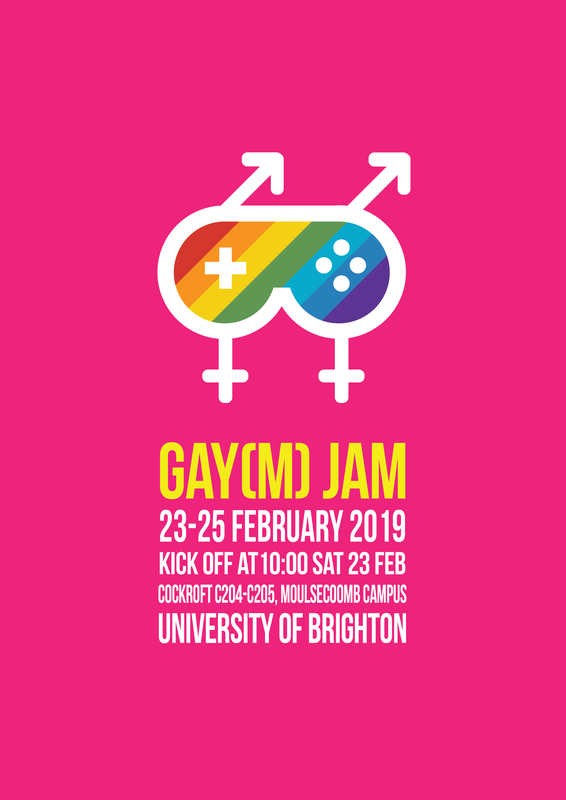 Money will go to supplying prizes for winners of the Gay(M) Jam with all remaining money going towards the LGBTQ+ Society to help support the great work they do at the University as well the Game Jam Society to further support students aiming for the Gaming Industry. We will buy Steam vouchers worth £10 for each member of the winning team. The rest of the money will be split equally between the Game Jam and the LGBTQ+ Societies. 50% of the money will be used to buy Steam vouchers for the winning team. The remaining 50% will be divided equally among the Game Jam and the LGBTQ+ Societies. What will we do with extra funds if things really take off and you raise more than your target? 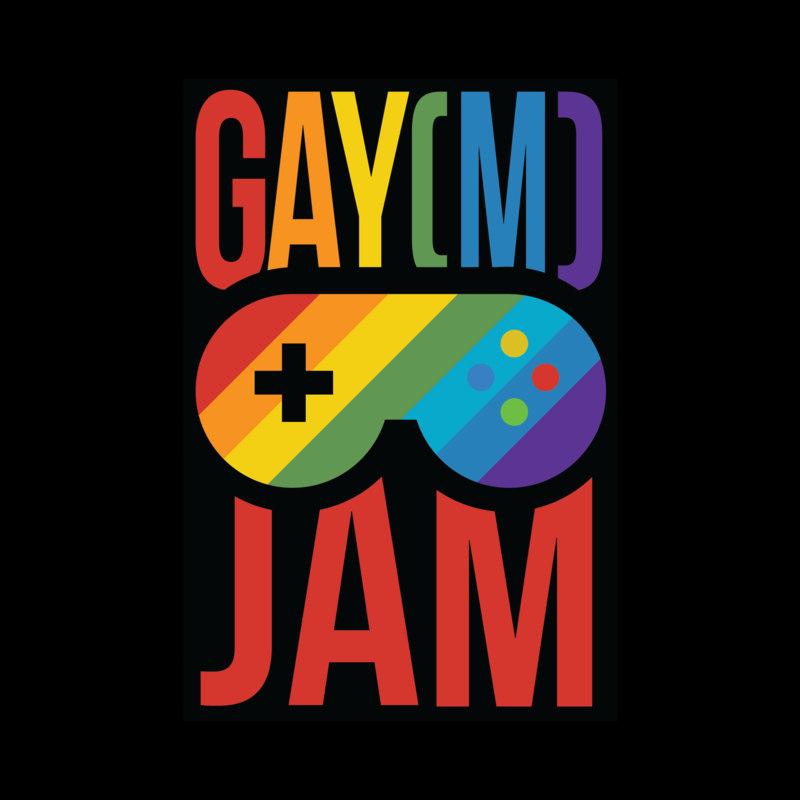 We will provide GAY(M) Jam t-shirts designed to all participants involved in the game jam, with all remaining money going to i) Steam vouchers for the winning team (50%); ii) the Game Jam Society (25%), and iii) the LGBTQ+ Society (25%). We have some very tempting rewards for you to be involved with our project. Take a look on the right hand side! You don’t just need to give money to help us succeed! Please share this project with anyone you think would support us – on Twitter, Facebook, LinkedIn, by email, telephone, in a chat over the fence or on your blog. In fact, share it with everyone you know as we think it's a great idea, and the more people who know about it, the more likely we are to make this work out brilliantly. And we know we said that money isn’t all we need, but we’d love it if you could donate. Please support us and help make this project happen! Receive a personal thank you from the Game Jam Society on social media. We will send you a free 'GAY(M) Jam' t-shirt.